Dan Matthews started his theatre career in his home town of Rock Springs, Wyoming where he earned an Associate of Fine Arts degree in Musical Theatre from Western Wyoming Community College. While continuing his theatre studies at the University of Northern Colorado he began exploring the Design and Technology fields. This led him to The Ohio State University where in 2006 he received an MFA in Theatre Arts with an emphasis in Scenic and Lighting Design. After 3 years as the Faculty Technical Director for the Kansas State University Theatre Department Dan relocated to Chicago, IL to pursue a freelance career in Design and Technical Direction. He found a niche with Chicago Shakespeare Theater as a House Carpenter and Tour Technical Director. In his 4 years as Tour TD he helped bring professional Shakespeare productions to schools all over Chicagoland, northwest Indiana, Wisconsin, and western Illinois. He is all too familiar with driving big trucks through Chicago rush hour traffic. 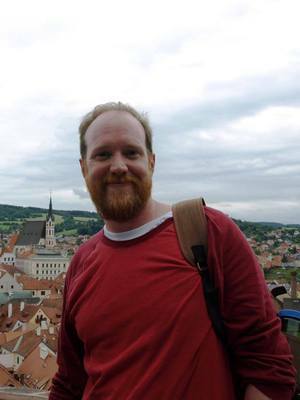 As an Assistant Professor for the Ohio State Lima Department of Theatre Dan fulfills the roles of Scenic Designer, Lighting Designer, Technical Director, and Production Manager. His Jack-of-All-Trades approach to theatre has prepared him well for this multifaceted position. He continues his relationship with Chicago Shakespeare Theater working as a contractor on various projects. He has also recently begun research on historic Czech Scenographic models and hopes to keep building relationships with his colleagues in the Czech Republic.